One of the widely used furniture at any house is the sofa. They are used by every family member and the guests that come to your house. Therefore the upholstery is bound to get dirtier each day that it gets used. The tapestry can be given the right care if it is cleaned on a regular basis. However it is difficult with the normal vacuum cleaner to deep clean your sofa. This is the time when your upholstered furniture requires the care of professional cleaners. Our cleaning company in Putney, SW15 London will take care of your sofa and any other tapestry you might have. We use the method of hot water extraction that removes any dust and dirt accumulated into the fibers of the tapestry. The sofa cleaning services offered by Cleaners Putney comes in various packages and you can choose the best one depending on the type and condition of your sofa. Of course you have the option to customize your cleaning needs and come to a perfect price. For cleaning your sofa we start the process with a simple vacuum which gets rid of the dust particles inside. However we vacuum clean it with some advanced and special vacuum cleaners. These are portable and small in size but much higher in power than the normal house cleaners. The other reason of them being such in nature is that it reduces any chance of damage which could be caused to your sofa. We use it around each corner and nooks of the sofa by which the dust and dirt is sucked out. 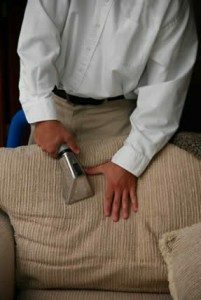 In case the sofa has some particles or some areas which are not easy to reach, then we use the blowers to help the cleaning procedure. We follow the above with the get rid of any stains or ink marks procedure. This involves use of special solutions which depends on the type of your sofa and the material it is made up of. We make several runs of the process and try it till we remove all the stains present on it. However in case there are permanent stains on it then we cannot guarantee getting rid of them.